Would you go down to the railroad track and stand in front of an oncoming express train? – probably not, yet that is what many investors are doing, metaphorically speaking, by remaining long the stockmarket at this time. 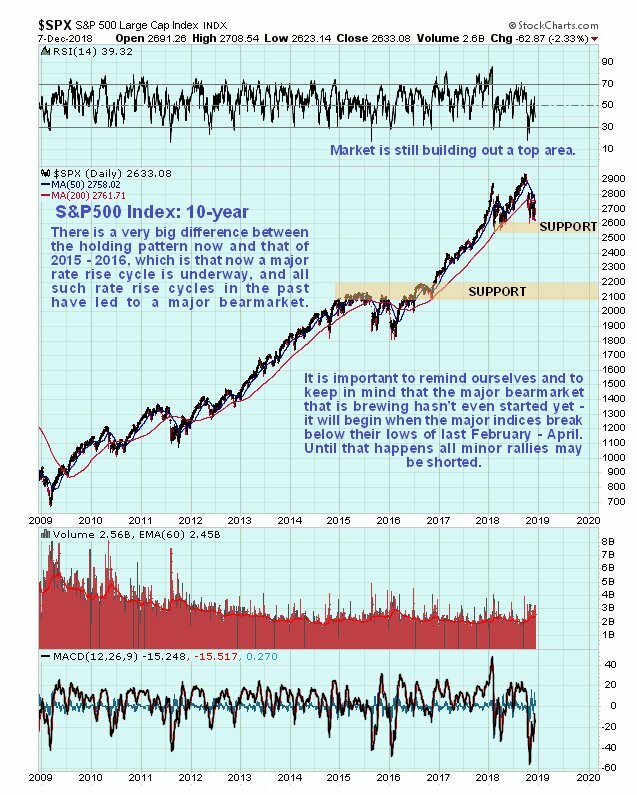 Last week, when the market dropped sharply, many observers talked about it “crashing”, but a quick look at our 10-year chart for the S&P500 index below makes clear that the crash hasn’t even started yetbecause it is still marking out a top area and the crash proper won’t begin until it breaches the nearby support in the 2550 – 2600 zone. That a crash is now inevitable is made plain by the rising trend in interest rates and the ongoing liquidity drain. Most investors are of course destined for misfortune, in some cases severe misfortune, when the crash hits. Yet there is absolutely no need for this to be the case – all an investor has to do to switch from the prospect of misfortune to that of good fortune is to do an about face, a 180 degree reorientation. To do this you have to stand the prevailing belief with respect to the markets that “up is good and down is bad” on its head, so that instead of automatically thinking this, like most everyone else, you think instead “down is good, up is bad”. Repeat this 3 times to yourself or however many times you need to until it’s second nature. Once this has sunk in you will find yourself cringing at the thought of being generally long the market at a time like this and vehicles like inverse ETFs and Puts will take on an attractive allure – and these may make the difference between you going down like the Lusitania or being on a roll when the crash hits. That said, there are always some stocks that go up even during a severe bearmarket. During a market crash 90% of stocks drop, but that also means that 10% go up, and if you can isolate those stocks whose fundamentals are so strong that they can buck the trend and advance, they are still worth going for. We will be looking at a number of such stocks in coming days. Perhaps the oddest thing about the great 10-year long bullmarket is that it has been of so little benefit to the broad swath of the American middle class, whose standard of living has been so eroded in recent years that after paying their bills they have little left over for stock trading. No – this bullmarket has largely benefitted the elites, the fabled 1%, who have been able to borrow heaps of money at low rates of interest and net fortunes in both the Real Estate market and stockmarkets. They have speculated heavily in Real Estate, buying properties solely for speculative gain which have often been kept empty, exacerbated the homelessness problem. This has been really extreme in China where entire ghost towns have been constructed that are never occupied. With the Real Estate market now turning, huge amounts of inventory are likely to be dumped onto the market that will in time collapse prices. Another reason that the stockmarket is so out of whack with the real economy is that prices have been artificially elevated by buybacks on a massive scale. Since much of this has been done on margin, it is clear that when the crash gains momentum it is going to result in ruinous declines. One of the biggest conundrums that we have to deal with at this time is whether the Precious Metals will get dragged down with the markets as it did in 2008, or whether it will break ranks and instead rally as a safe haven. If we were to go solely on the COTs and the gold to silver ratio, we would conclude that a major PM sector bullmarket is soon to begin, otherwise, however, the omens are not good, for as we will see commodities generally look set to drop with the stockmarket, especially key commodities like copper and oil. Key to resolving this contradiction is the outlook for the dollar, whose fortunes hinge on the course of interest rates. The Fed is caught between the proverbial “rock and a hard place”. 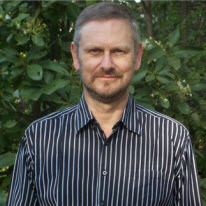 Unlike back in 2008, it is not in a position to reverse course on its program of rate rises, because demand for Treasuries is slack compared to back then, which is due to the twin reasons of ballooning deficits and the hardened resolve of big foreign powers to dedollarize, after being subjected to prolonged economic bullying via sanctions and trade wars and crude military threats. If it were to reverse course on rates, both the dollar and Treasuries would cave in, so the markets would force rate rises anyway. Faced with this prospect, the Fed is thought likely to continue with its rate rise program, which will cause the stockmarket to crash, but this is far preferable to a collapse in the Treasury market which would lead to a funding crisis. 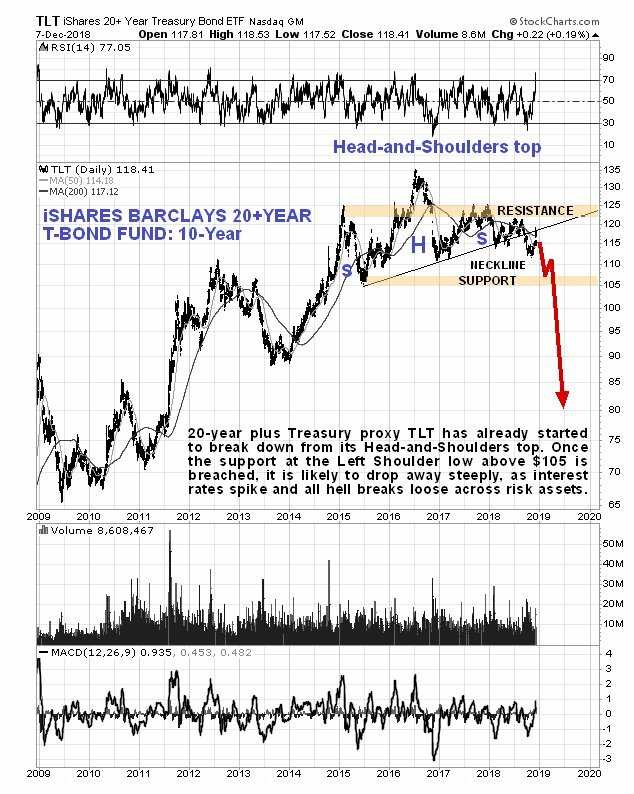 Thus, it seems likely that the Fed will keep on rising rates, stockmarkets will crash, and the resulting “dash for cash” will buoy the dollar and temporarily stave off a collapse in Treasuries. 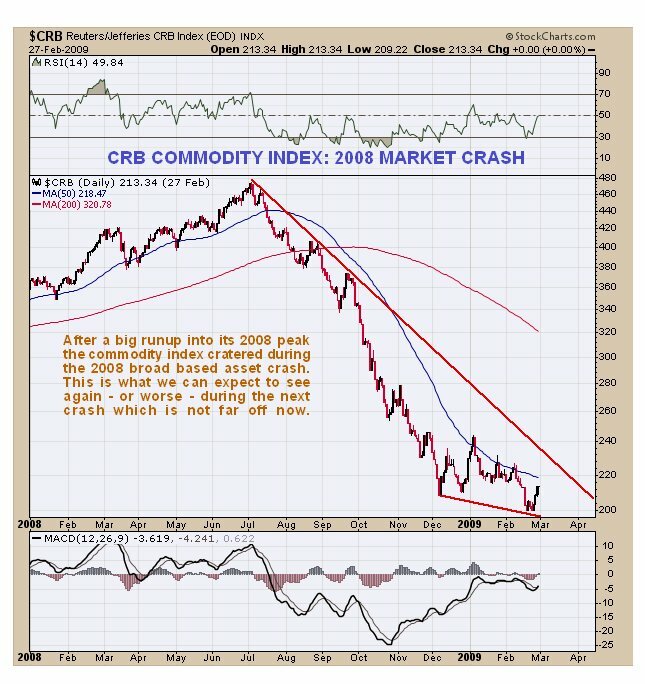 For this reason, just as in 2008, it looks likely that commodities will go down with the stockmarket, and for a time that will include gold and silver. The deepening crisis and looming economic depression will lead to strident demands for intervention so that the Fed finds itself forced to revert to emergency QE, which is what will usher in the end game for the Fiat era, as the dollar craters and hyperinflation approaches. The moment the Fed caves in and resorts to another round of QE, this time of unprecedented magnitude, gold and silver will take off like a rocket. This may be the underlying message of the already bullish gold and silver COTs and gold to silver ratio. We will now go through a range of charts to see how things are shaping up, and as we will see, the charts are pretty much telling the same story. 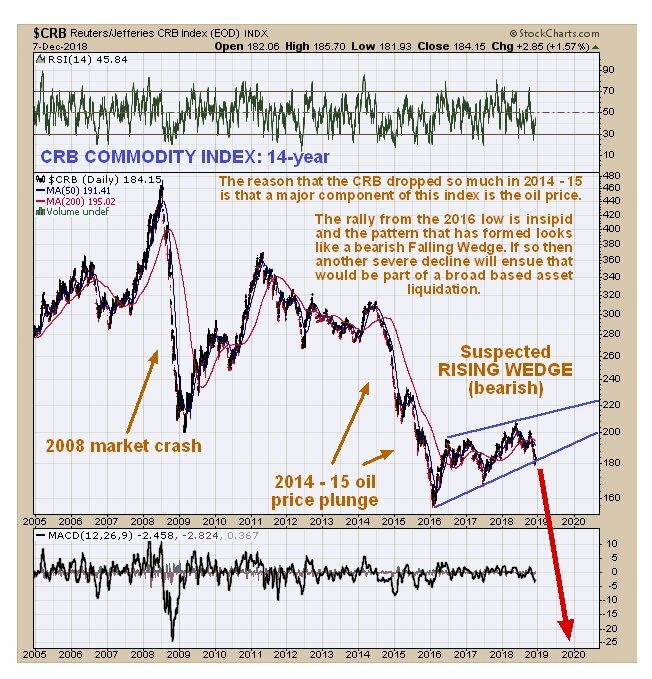 We will commence with commodities and to gain an overview, and we’ll start by looking at the latest long-term 14-year chart for the CRB commodity index. As we can see, it is starting to break down from a large bearish Rising Wedge, that started to form back at the beginning of 2016. This chart projects another severe downleg similar to the one that preceded the Wedge. 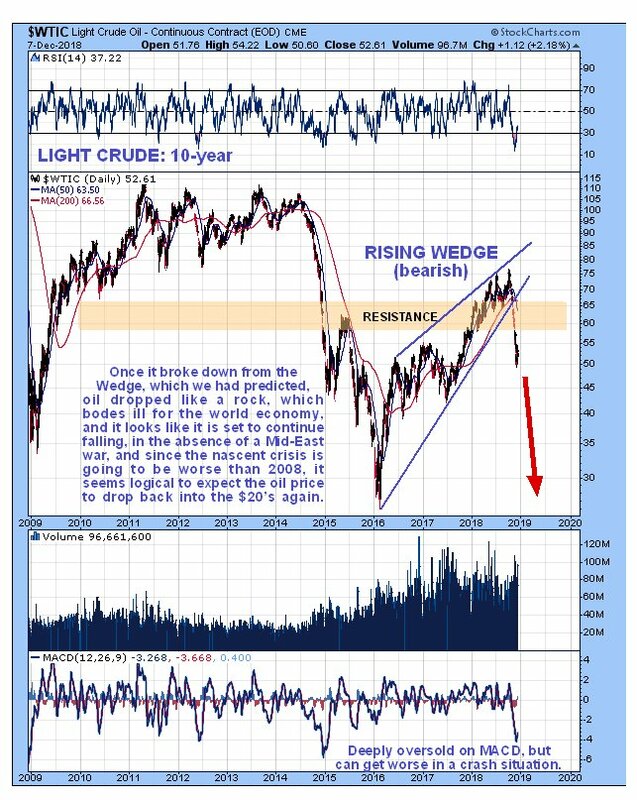 A big component of the CRB index is the oil price, and as we know, oil has been dropping like a rock in recent weeks. 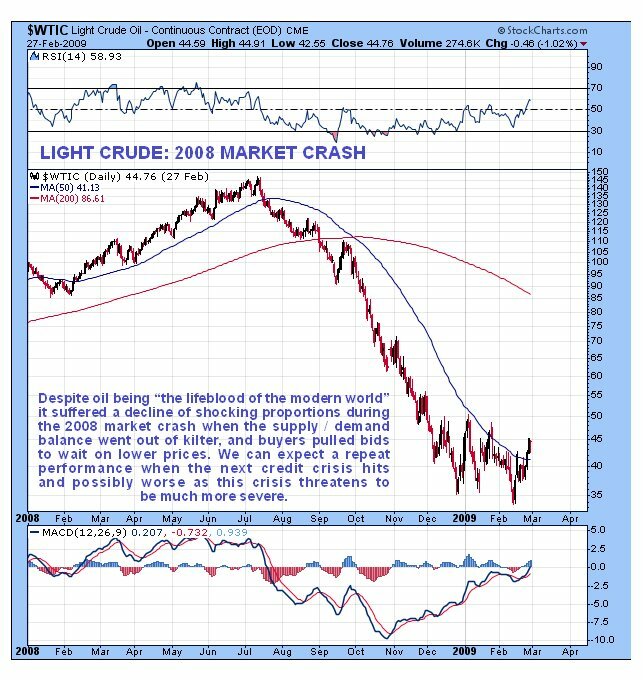 The latest 10-year oil price chart looks terrible, and although it has lost one-third of its value in the space of a few months, it looks set to continue to plummet, and given that the emerging crisis is set to be far worse than that of 2008, it is clear that we could easily see the oil price back in the $20’s, or even the $10’s. As for copper there’s no good news there either. 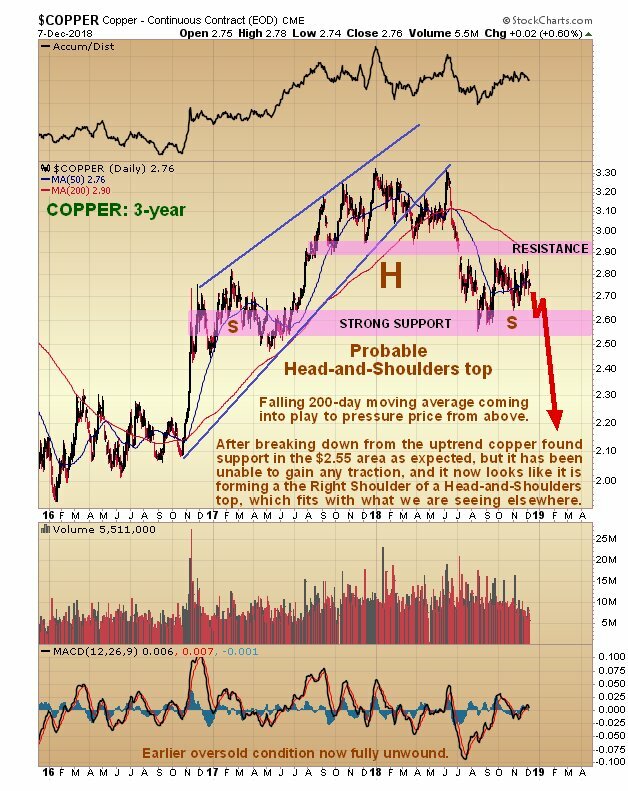 Copper found support in the $2.55 area, where we expected it to, but has not been able to gain any traction since, and now it appears to be marking out the Right Shoulder of a Head-and-Shoulders top, with the falling 200-day moving average coming into play and threatening to break it down from this potential top area. Again, if the strong support shown fails, a heavy drop will be in prospect. What about gold and silver? 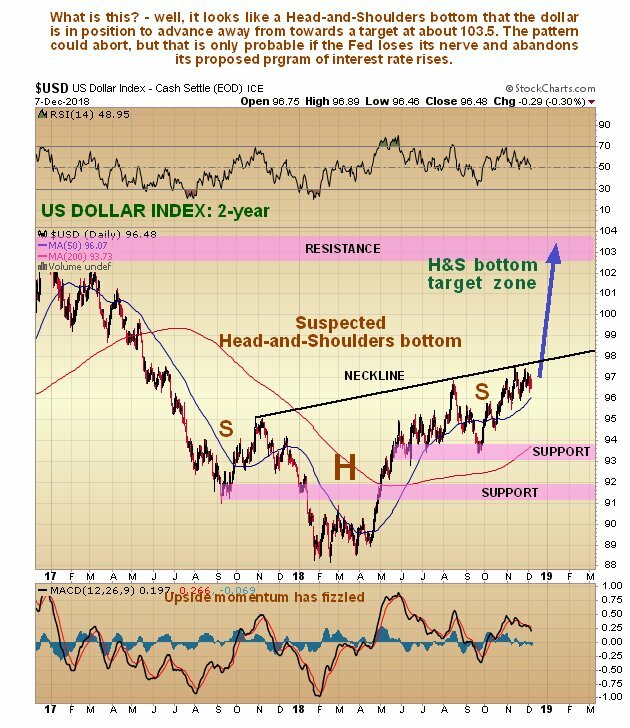 – you would think that they would buck the trend, given their now historically bullish COTs and very positive gold to silver ratio. One would think so, but unfortunately it doesn’t look like they will for two reasons – one is that they will temporarily fall victim to across-the-board mass asset liquidation like everything else, and their performance during 2008 gives us a fine example of when that was actually the case. 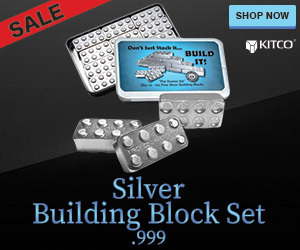 But the bullish COTs and super bullish gold to silver ratio must count for something surely? They do – they are indicating that if gold and silver drop again, dragged down by the mass asset liquidation, they are going to be like a beach ball pushed underwater, which will burst up to the surface immediately it becomes clear that the Central Banks are losing their nerve and set to revert to emergency QE, and they are likely to take off before it becomes clear that this is going to happen, since Smart Money will get wind of it before the mob, of usual, so we are going to have to be ready to move fast, as this time the PM sector will take off like a rocket and it won’t be coming down again. You will recall that for a long time we thought that a complex Head-and-Shoulders bottom was forming in gold, but it is becoming increasingly clear that the pattern has been spoiled by the breach of the uptrend line shown on the right side of the pattern several months back, which makes gold vulnerable to further losses, especially given the bearish patterns that are unfolding across the commodity sector, particularly in oil. 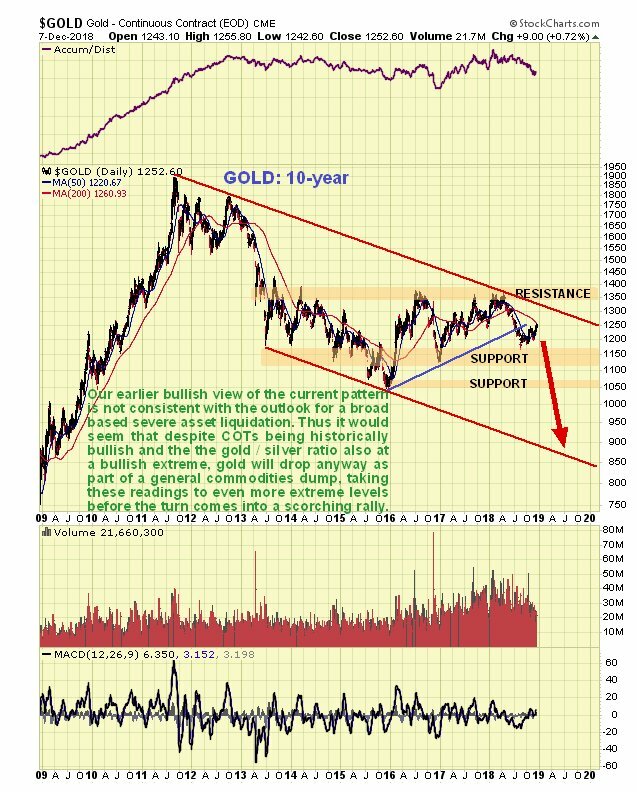 In a market crash situation it could drop to the bottom of the giant channel shown on our 10-year chart, which would put it at about $900, despite the seemingly bullish COTs and gold to silver ratio, which we can only presume will be more bullish still as gold hits bottom, leading to a violent reversal to the upside. The big difference between now, in addition to all the fallback positions that existed back then having been used up or exhausted, is that the Treasury market looks set to tank too. Basically the world is awash with debt, especially given that the Fed is dumping Treasuries over the side as fast as it can with other CBs set to follow suit, and only a madman would buy it – or someone who is not spending his own money. See J P Morgan Spots The Next Big Problem – A Plunge In Global Bond Demand. The conclusion to all this is that yields are going to spike – and drive a stake through all risk assets. This is why at some point the CBs are expected to intervene with emergency QE, which will tank the dollar and send gold and silver through the roof. So what is an investor to do? Broadly speaking the strategy is clear and simple. Apart from a few special situations or quick trades, the right strategy, until the Fed and other CBs fold and intervene, due to extreme pressure resulting from a market crash environment, is to be in cash and inverse ETFs. We have already taken positions in twice leveraged inverse ETFs and stand ready to go for some of the more risky triple leveraged ones once the broad US stock indices crash the support at their February – April lows, or look like they are on the verge of doing so, when we also selectively consider additional Put strategies. Many gold and silver shares should be either liquidated or hedged. Beyond that we will be on the lookout for the CBs panicking into emergency QE, which will spark the biggest stampede into the Precious Metals sector in history. One final point – if we do see the customary Santa Claus rally, caused by adults temporarily losing their grip on reality due to festive good cheer and the easing of end-of-year tax loss selling, it won’t change anything, and there is a fair chance that the Grinch will cancel it this year. So to sum up, a market crash looks imminent and if it doesn’t start immediately it should get underway quite soon. Our strategy at this time is to be generally short the market, using inverse ETFs, which it is thought best to refrain from trading, whilst long a few exceptional stocks such as several we will look at in coming days, and unless the Fed caves in on its rate rise program, it is thought best to hold off from buying most PM sector investments until the initial crash phase has almost run its course. Options, especially Puts for the downside, we will of course trade much more aggressively, which is what they are meant for, an example being the trades last week where we tripled our money in Amazon, Apple and Home Depot Puts in 2 trading days, and if we can time the breakdown into the main crash, we will consider adding some triple leveraged inverse ETFs the better to capitalize on it.